Who doesn’t like food? One of the things I look forward to the most while traveling, besides visiting UNESCO World Heritage Sites, is the wonderful array of things I can eat in other countries. Korean food does not disappoint with a wide variety of dishes at very affordable prices [mostly]. If you missed my list of top 5 favorite Korean foods, main dishes and snacks/street foods, go here and here (respectively). Here are another 5 dishes to fill up your stomachs. 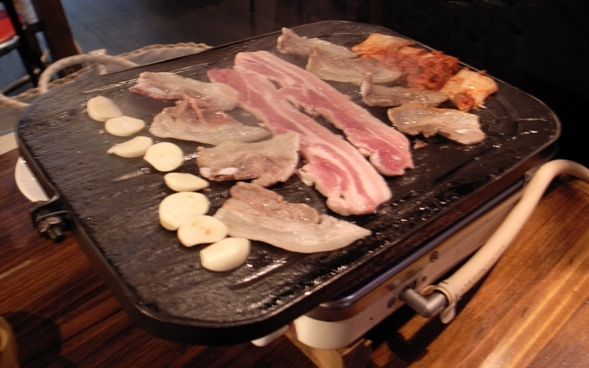 Samgyeopsal is one of the most common meals you can have while eating out in Korea. A strip of samgyeopsal looks very similar to a large piece of bacon, but tastes considerably different. It is usually grilled on the table in front of you, and in most places, you are expected to grill the meat yourself. It is usually accompanied by many side dishes like kimchi, seaweed soup, onions, other kinds of kimchi, more kimchi, and rice. The kinds of side dishes (and kimchi) depend on the establishment and quality (and price) of the place. Some people even choose their favorite restaurant based on what side dishes are offered. In my favorite places, genip (sesame leaves) is one of these sides so you can make a leaf taco out of your samgyeopsal. Unfortunately, many of these restaurants will turn down single hungry customers as the meal is for two people minimum (a Singaporean I recently met learned this the hard way), so make sure to make some friends before going out to eat. The best comes with an egg :). Kimchi, much like egg and onion, tastes very different depending on how you make it. In kimchi dumplings for example, it almost tastes like spicy meat. Kimchi boggeumbap doesn’t have that strong kimchi taste you get with plain kimchi. It is the mixture of rice and tiny pieces of kimchi, along with some spices and sometimes, finely diced pork. While it can taste bland in some places, when done correctly, it is quite a divine meal. Some people complain that it is too spicy, but I personally don’t really like spicy food and can handle kimchi boggeumbap just fine. 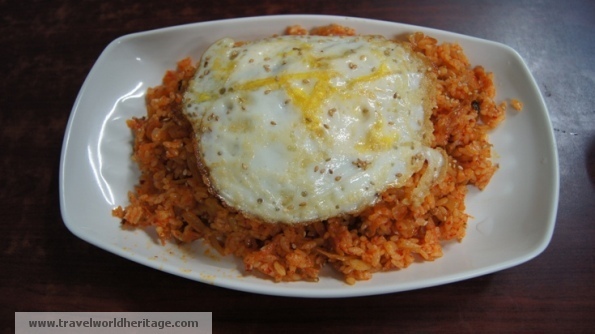 A small place near where I live makes the best kimchi boggeumbap (and 2 other meals I mentioned in the last list) I have ever had with an egg on top. Here is a map. It sometimes comes in a soup. This is probably the most obscure, difficult to find, and unpopular meal in Korea this entire list. Yeongol is bone cartilage, mostly enjoyed by the same kind of people who like to scrape off every piece of edible meat off a bone (myself included). Yeongol looks almost transparent or white, and can be very sticky if you touch it with your fingers. The texture is very chewy, similar to vinegar pork rinds / cuerritos (Mexican snack) or pork feet if you have ever had one of those. I can tell your mouth is watering already! I might not have sold you on this meal, but hey, you only live once, give it a try and you won’t regret it. 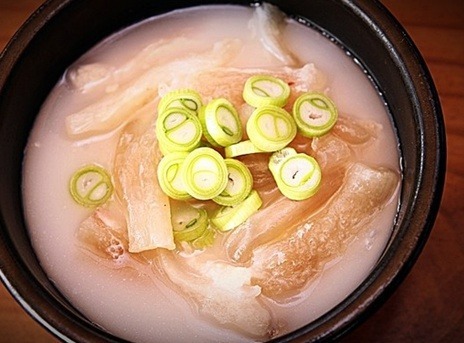 As one of the most popular Korean dishes, you can get it even outside of Korea. Bulgogi is made of very finely cut slices of beef that are marinated for at least a day, a recipe that has been around for a thousand years. What makes this dish awesome is the tenderness of the meat. Bulgogi uses mostly “Han-U,” (Korean domestic beef) the most tender, fresh, and finest beef in Korea. It is often cooked in front of you, and eaten with rice along with the standard variety of Korean side dishes. Much like samgyeopsal or dakgalbi, this is also a communal meal, so try to go with a friend. 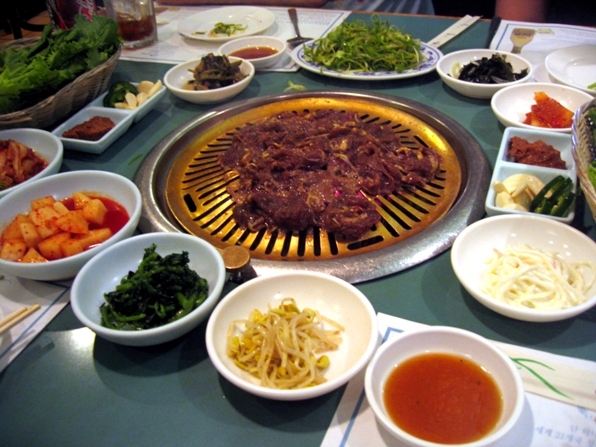 In the 2011 list of top 50 best foods in the world by CNN, Bulgogi came in at #23! 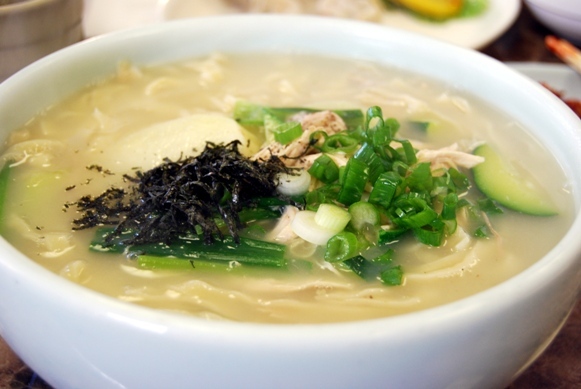 Kalguksu is a noodle soup that literally means ‘knife-cut noodles’ because they are (supposed to be) hand cut with a knife, not spun. They are wheat flour noodles which are usually quite thick leading to a very rich taste. While wikipedia insists that it is a ‘summer food,’ in my experience, kalguksu restaurants are extremely packed during the winter months when the warmth of the noodles helps you forget that the ice age is coming to Korea! The best kalguksu restaurant I’ve eaten in calls itself “Son Kalguksu / 손 칼국수 / Hand(made) Kalguksu” where the cook cuts the noodles by hand in the restaurant in front of you (kind of) while you wait. Simply put, this is one fine Korean food. If you have any other Korean food favorites, put them in the comments!